a) River cruise - A boat tour on the river Spree gives you a great first impression of the city. There are many departure points, and the tours are frequent and run all day long, so there is no need to pre-book. There are various tours on offer. We opted for a one hour round trip (covering the Government district, Museum Island and the Nikolai Quarter), departing by the Bahnhof Friedrichstrasse, and it was perfect. You can specify the car type at the time of booking, and I was glad the weather was picture perfect for our convertible. The Reichstag building is a symbol of Berlin's post war history, and since the reunification of Germany it houses the german parliament, which temporally moved to the city of Bonn during the cold war era. Since the wall came down, it has been completely reconstructed by the british architect Norman Foster. The glass dome offers a 360 degree panoramic view, and has become one of Germany's most visited attractions. 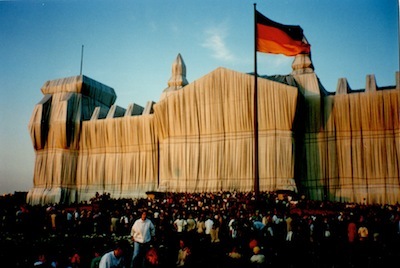 This is how I saw the Reichstag in 1995, wrapped by Christo (the glass dome had not yet been constructed). the guide will stop and start according to your position. It takes about an hour to go up and back. I booked ours so that it would finish at lunchtime, as I had reserved a table at the Käfer rooftop restaurant (the Reichstag is the only parliament building in the world which houses a public restaurant), located directly opposite the glass dome's entrance. For security reasons, you need to bring a passport for the Reichstag and Käfer Restaurant visit. The Kurfürstendamm is one of Berlin's major shopping streets, located in the western part. Hermès is based at No. 58, and can be spotted easily because of a row of scarf display vitrines on the pavement. The autumn/winter scarves had not arrived yet, so no orange box as a souvenir! 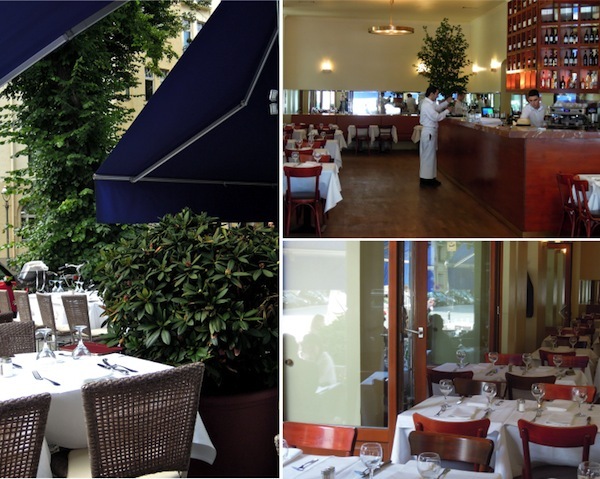 If you go to Hermès around lunchtime, don't miss adnan's restaurant, which is located in a side street, just a couple of blocks away from Hermès. The cuisine is mediterranean, and everything we had was delicious. Adnan himself (wearing a straw hat in the picture above), comes in every day, greets and chats with his guests, and is the perfect host. The prices are reasonable, and you might spot Rupert Everett here (it's his favorite Berlin restaurant according to his latest book, 'Vanished years'). Thank you so much for these tips! Can one get by with just English in Berlin, e.g. any problems with road signs, or asking people for directions, etc.? How are prices compared to Paris? Are there still many difference between the former East and West? I've never been to Germany before. Such a great city, I love it there, it can be ugly in parts but haunted by the ghosts of history, I absolutely loved it. So glad to hear you had a great time! These are wonderful travelogues. And so timely for u--we're going to Berlin for two weeks at the end of this month. Thanks for doing the research for us! Oh how lucky to have Berlin to look forward too! Hope you’ll enjoy the upcoming tips, and wishing you a most wonderful and fun trip!! How fun it should have been, I'm sure DS loved the Traban tour as much as you did! Don't we feel lucky and comfortable when back in our actual cars?Thanks for sharing all the details and nice places to visit with us. Berlin was not on my list but will probably be after your travel reportage. Have a sunny and warm week ahead très chère MT. We even felt lucky to be back on our bikes! It was a great experience though. To think that until 1989 those who lived east of the wall had no other option.. and this was just a tiny inconvenience compared to the oppression and lack of freedom. I ‘ll never forget the images when the wall came down, and the first Trabis came driving into the west.. under thunderous applause and jubilation. Hope you’ll visit one day, dear Catherine, it is such an amazing place. Berlin has been a huge hit with my entire family, and it's a great place to visit with children. DS absolutely loved it. The summer went by far too quickly here as well, but we still have another three weeks before school starts again. Hope ‘La rentrée’ will be smooth for you and yours, and have a wonderful last holiday week! Adding a Traban Tour to my bucket list! Looks like loads of fun! I just booked my trip to Paris for October...hoping that I'll be 100% healed by then. I can't wait to see more of this travelogue. You always inspire! Out of curiosity: I remember that Trabant had the gear lever on the steering wheel - have you used such the one? (At a later phase, I think the gear level was moved downwards). If so, have you managed to drive it on your own (many people find the gear lever position on the steering wheel odd and difficult to handle). I got an award by my university during study - the award was 2-weeks travel throughout (West) Germany, the then West Berlin included. However, at that time, some 6 months before the wall "fell down", there were many questions when I came before the wall. What was beyond? How do the people feel and so on...very unique feelings back at that time. I would like and hope I will return soon. 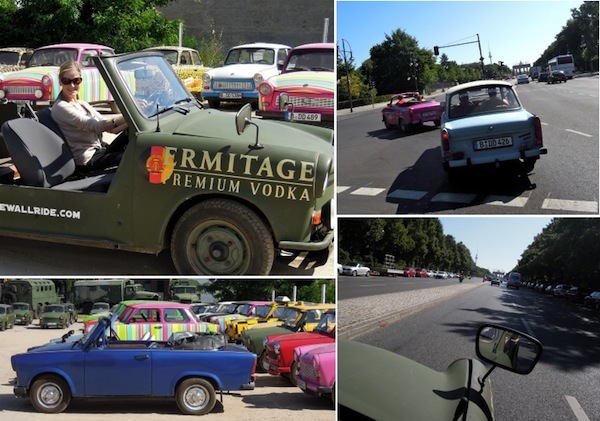 Re the Trabi, all cars in Safari’s fleet had the original four speed gearbox, with an H (!) column shift by the steering wheel. DH and I were both awarded with 'Trabi driving licences' (there is a break halfway through the tour, allowing drivers to switch). It took some getting used to the lever.. have to admit the engine died on me a couple of times at first! How is security in Berlin? Are the streets generally safe to walk around on? I know that like all cities, there will be areas to stay away from, but how is Berlin in general? Thanks for your wonderful posts! A beautiful trip with a great dose of culture, history, shopping and great food! 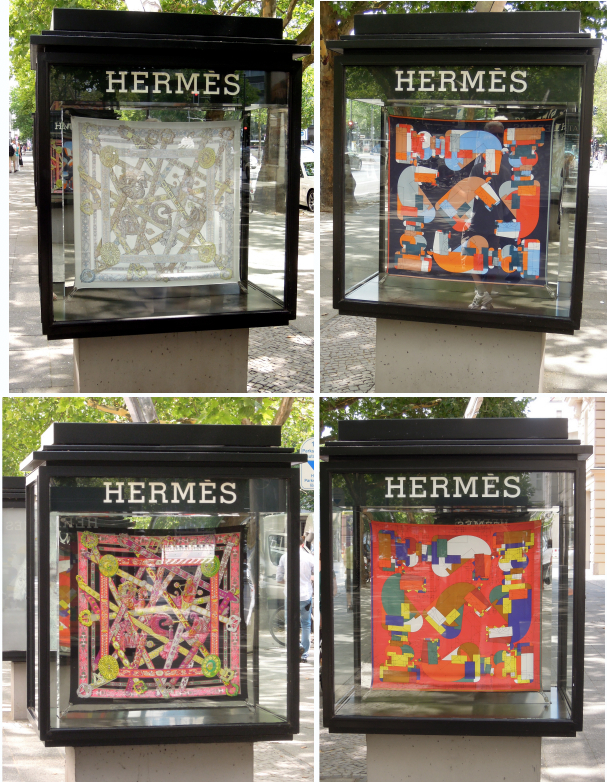 Love the Hermes scarf display...surely would have stopped me in my tracks! It's been truly fabulous, Berlin has so much diversity and color, and so much to offer. Berlin seems to be such a fascinating city and I remember the fall of the Wall too, with all it meant for Eastern Berliners and the world in general. Thank you for the lovely photographs, my dearest MaiTai. Thank you, dear for this post! DH and I missed going to the Reichstag for some reason, but will be sure to visit it the next time we're in Berlin. 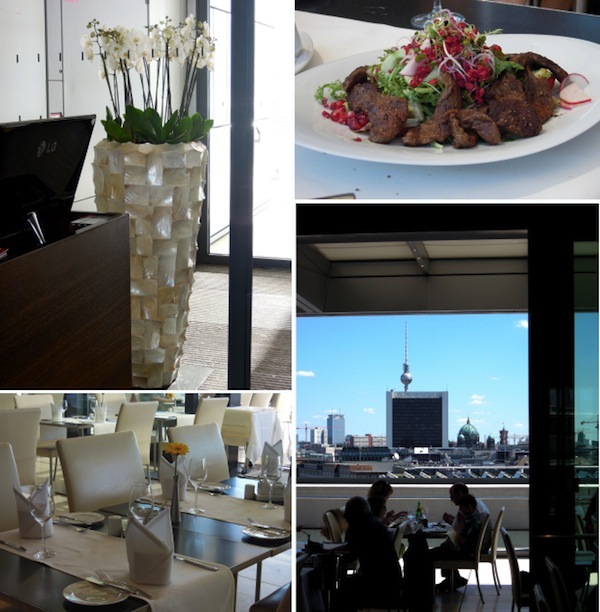 Did you visit the "Tele-Spargel" (TV tower)? It's so hard to get many of the sights in while there, but the river cruise and Reichstag are on the list (as well, as H, of course). I hope you visited and will mention the Gedaechtniskirche, liebe MaiTai. The beautiful modern stained glass by French artist Gabriel Loire is so calming and one can often happen onto a concert. It's a nice spot to rest for a bit. My church here has windows by him also--I feel so lucky. My son and I were in Berlin in 2003 at New Year's, and it was terribly cold, of course, but it was fun to watch the ice-skaters on Unter den Linden and the fireworks over the Reichstag. I had been there in 1985, so it was very moving for me to be able to walk through the Brandenburg Gate, and walk along that bronze line in the streets and Potsdamerplatz, and tell him what it was like to visit the eastern sector. He was a baby in 1989 and I was at home with him, watching the news with the wall coming down, wanting to be there celebrating. Dear MT, it's interesting that the people dining alfresco at Adnan's restaurant at lunch seem to be all older people, and the people dining alfresco at Borchardt's courtyard for dinner seem to be all younger people and furthermore all the women seem to be in black and all the men seem to be wearing white shirts. I am wondering if Berliners live a very disciplined life . . . very much on schedule, dutiful, punctilious, all-round plugged into the rhythmn of life of everyone around each other in Berlin? If so, I think it's a great trait! Germans are well known for their precision work, etc., right?